Gout, a form of inflammatory arthritis, is characterized by recurrent attacks of a swollen joint. It is caused by elevated levels of uric acid in the blood, which may crystalize and deposit in joints, tendons, and surrounding tissues. The incidence of gout has increased in recent decades, believed to be due to increasing risk factors in the population, including metabolic syndrome, longer life expectancy, obesity, and a more sedentary lifestyle. Currently, it is treated with nonsteroidal anti-inflammatory drugs (NSAIDs), steroids, or colchicine for acute attacks, along with allopurinol or probenecid for long-term prevention. To investigate the effects of experimental compounds on the treatment and/or prevention of Gout, Biomodels employs a rodent animal model of Gout. Symptoms of gout are induced by intra-articular injection of monosodium urate crystals (MSUs) directly into the ankle joints of rats. Swelling of the injected area can then be tracked daily using a validated 5-point scoring scale and ankle diameter measurements can be conducted using digital calipers. Static weight-bearing measurements, consisting of placing the animals in a holder while their hind paws rest on two separate sensor plates, can be performed to determine an average force (weight) for each paw. Additionally, plantar tests, which consists of an infrared (IR) source placed under a glass floor underneath the hind paws of animals (at an intensity of 40-75% - based on baseline sensitivity), can be conducted with variable frequency to determine the relative sensitivity of the animal to pain. At the conclusion of the study, blood and/or tissue collections may be performed for additional downstream processing. A summary of the Gout model design is depicted below. 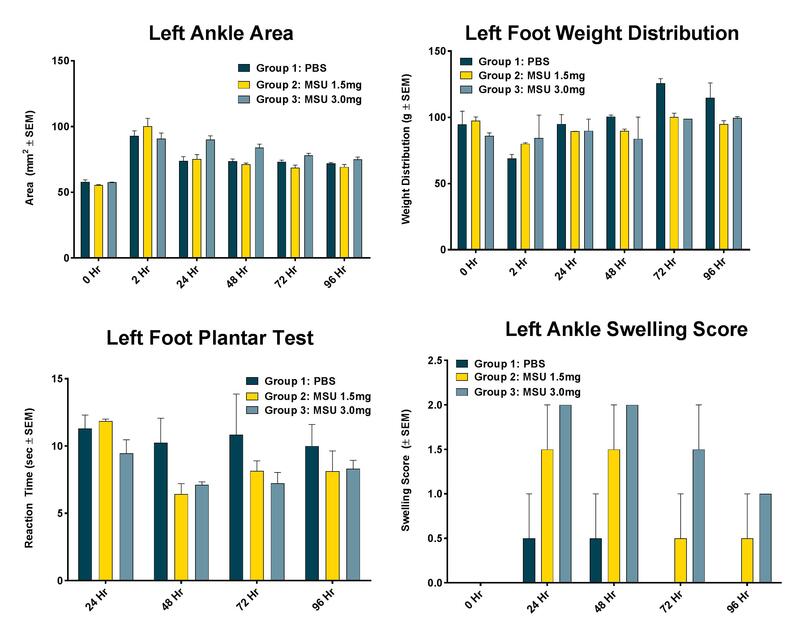 Accompanying data shows that increasing concentrations of MSU crystals directly into the left ankle leads to acute increases in ankle diameter, reductions in weight distribution on the affected foot, increased reaction time on the plantar test, and increased ankle swelling scores.